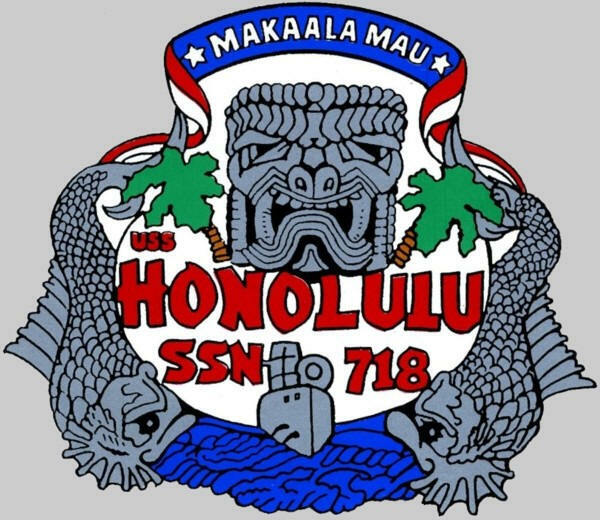 The central theme of the design is a tiki image of "Kuka'ilimoku," the Hawaiian god of war. During the wars of Hawaiian unification by Kamehameha, the first King of Hawaii (1790-1832), it was believed that Kamehameha took on the power (or "mana") of Kuka'ilimoku during battle. 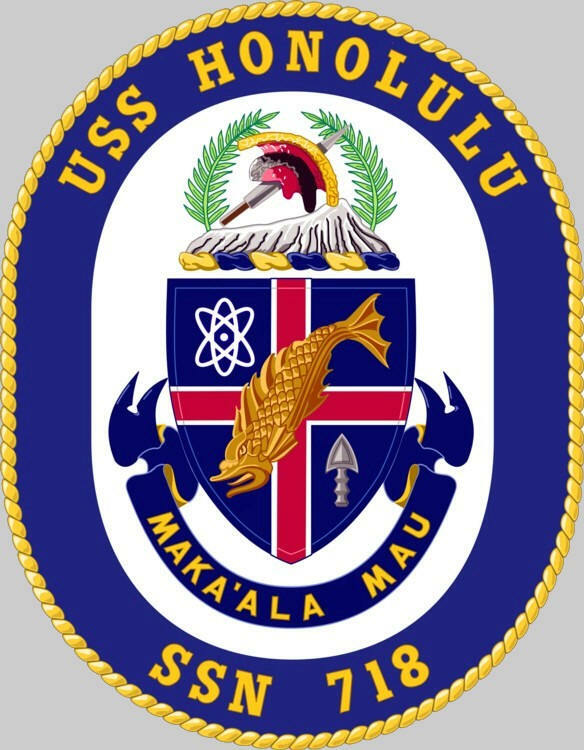 The pennant with the ships' motto "Maka'ala Mau", meaning "Always on the alert," centered in a blue field represents both the commissioning pennant as well as the colors of the national ensign. 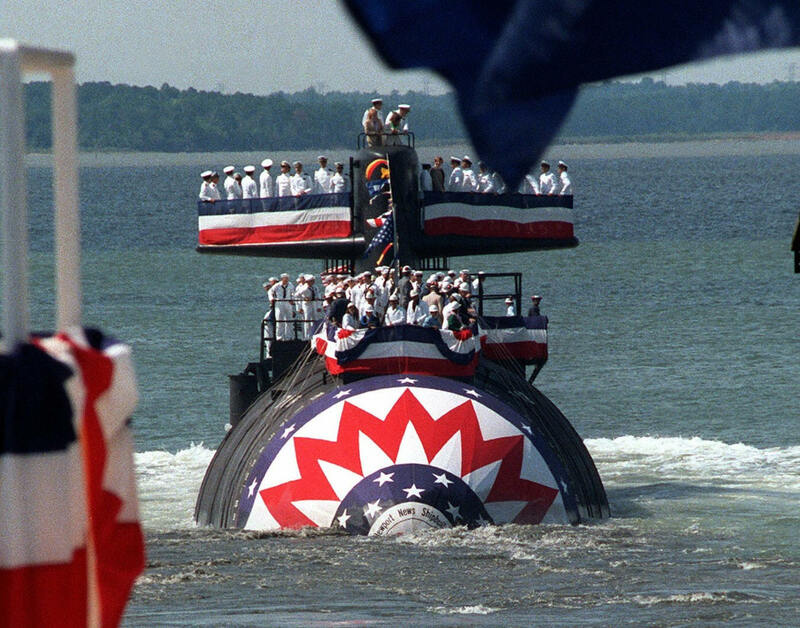 The diesel boat and dolphins illustrate the submarine's heritage. The palm trees are typical of the Hawaiian Islands and compliment the symbolism of the tiki, as well as add color to the design. Commissioned at Naval Station Norfolk, VA. Sponsor: Mrs. Joan B. Clark wife of The Honorable William P. Clark, former Secretary of the Interior and Assistant to the President for National Security Affairs. Honolulu departed Norfolk, VA for her first extended at-sea period. She sailed to Roosevelt Roads, Puerto Rico for Weapons System Accuracy Trials (WSAT) following which she made a brief port visit to St. Croix, U.S. Virgin Islands. Honolulu completed acoustic trials at the Atlantic Undersea Test and Evaluation Center (AUTEC) prior to returning to Norfolk on 28 Sep. 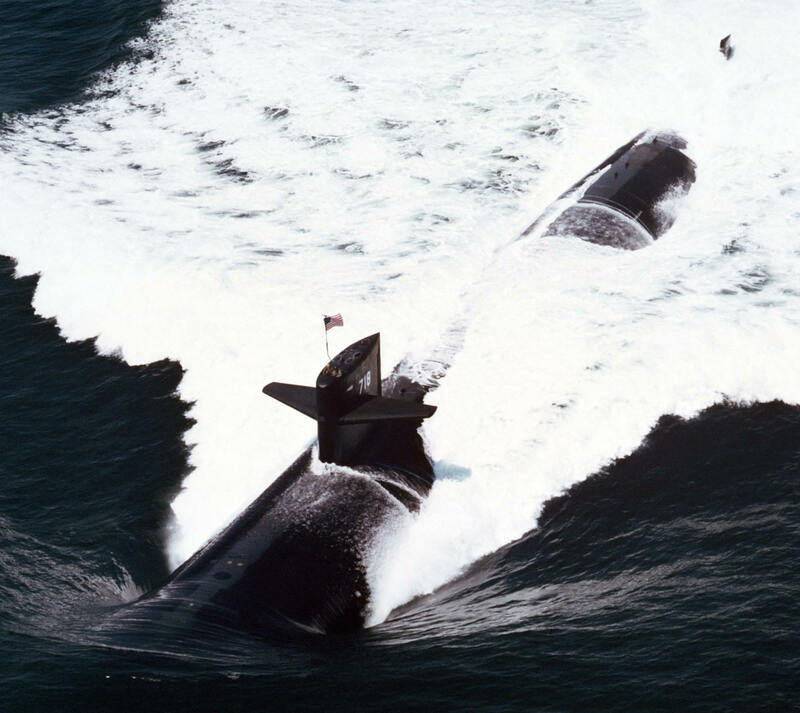 In early October, Honolulu completed Harpoon Weapons Certification and began workup for her first Operational Reactor Safeguards Examination (ORSE). Honolulu completed her ORSE from 22-23 October with an overall grade of average. 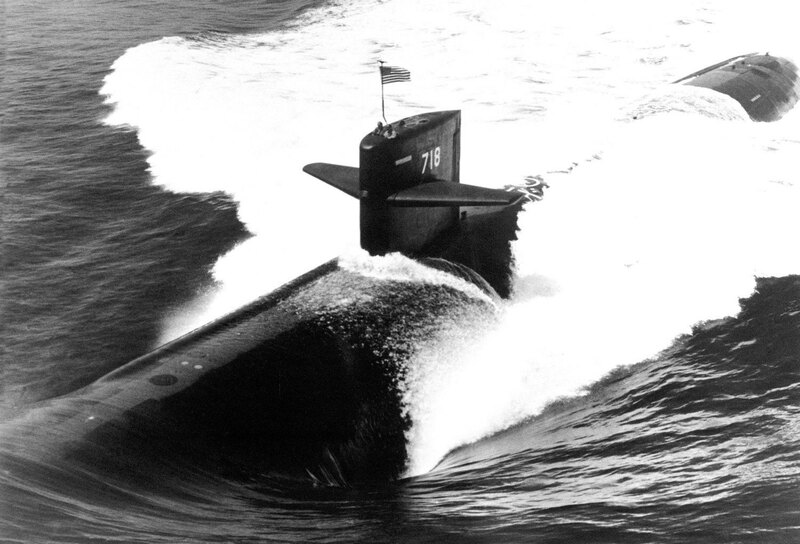 Following ORSE, Honolulu sailed to AUTEC for MK-48 Torpedo Certification (11 Nov). Honolulu returned to Norfolk in time for the holidays. 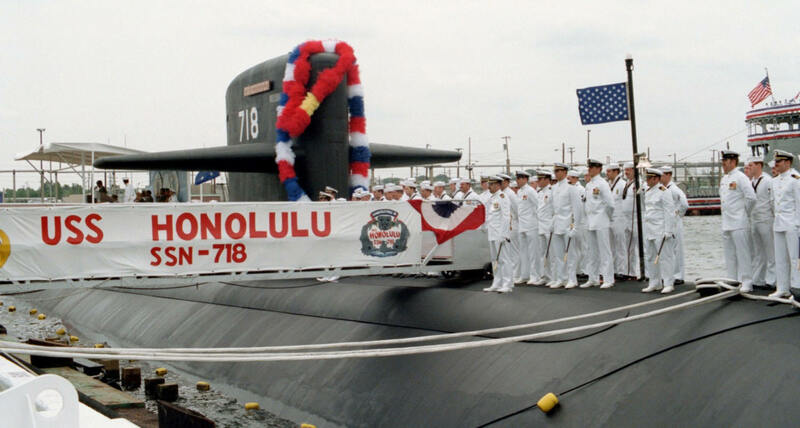 Honolulu participated in the Atlantic Fleet Submarine Exercise LANTSUBASWEX 3-86 and FLEETEX 1-86. 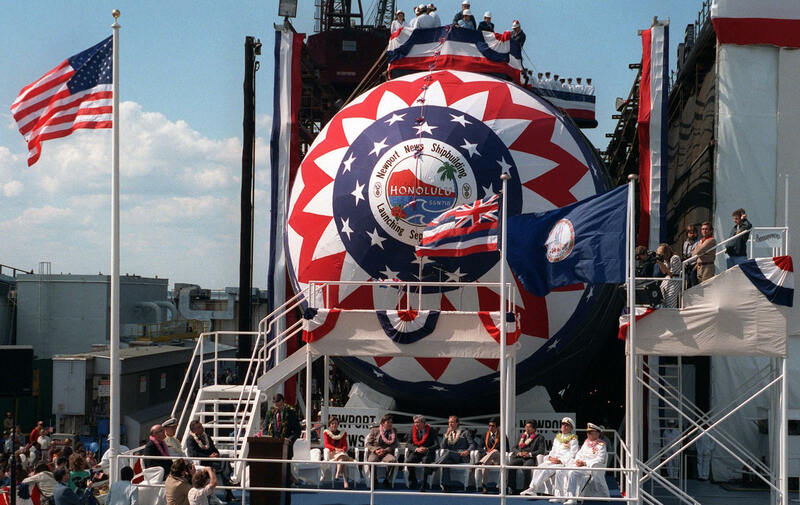 Honolulu underwent Post Shakedown Availability (PSA) at Newport News Shipyard. Honolulu departed Norfolk and sailed toward Pearl Harbor, Hawaii. En route she stopped for a liberty call in Fort Lauderdale, FL. 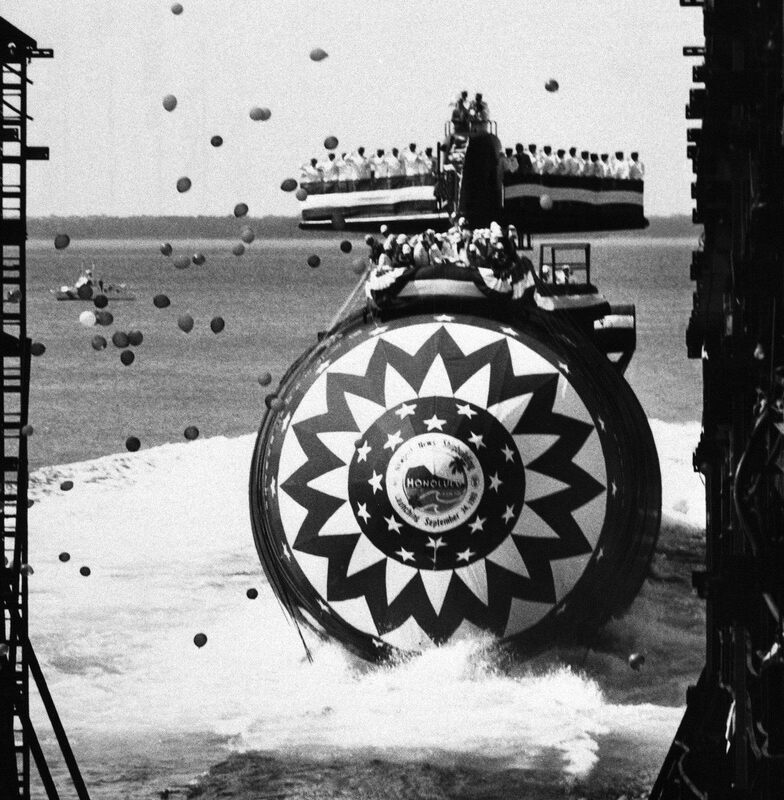 Honolulu transited the Panama Canal and turned south to the Equator for a "Shellback Ceremony." One hundred and eleven Pollywogs are initiated into the "Order of the Deep King Neptune." 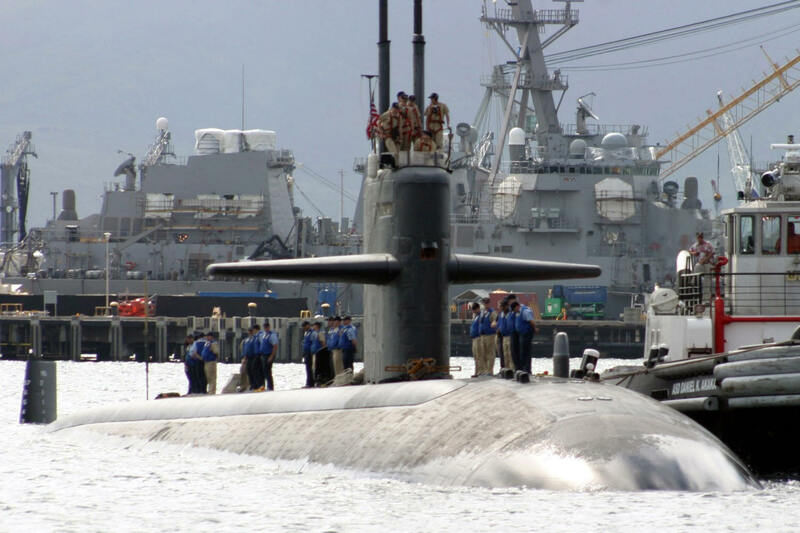 Honolulu spent the remainder of the year in port completing a Nuclear Weapons Acceptance Inspection (NWAI) and Supply Management Inspection (SMI). 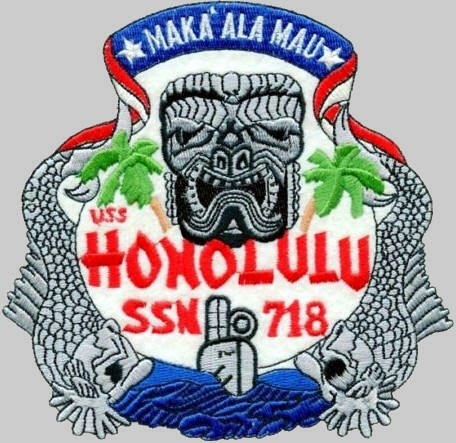 Honolulu began a busy year at sea participating in FLEETEX 1-87 and Prospective Commanding Officer Operations (PCO OPS). Following these events she began her Pre-Overseas Movement (POM) cycle including Pre-Deployment Training (PDT) and upkeep in March and April. Underway from Pearl Harbor for a western Pacific deployment. In port Moen, Truk Island, thus becoming the first warship since World War II to enter that port. Unfortunately, when departing Moen, Honolulu touched aground forcing the ship to Guam for minor rudder repairs. Underway from Guam for operations. In port Subic Bay, Republic of the Philippines for liberty. 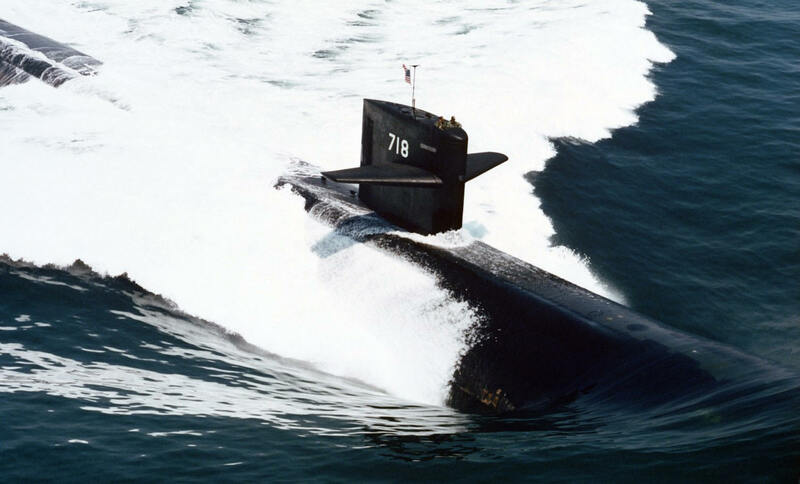 Following her stay in Subic Bay, the submarine sailed to Yokosuka, Japan for a upkeep. With minor repairs complete, Honolulu then sailed for Hong Kong on 8 September. In port Hong Kong for five days of liberty. Honolulu returned to Yokosuka, Japan for her last upkeep prior to heading home. In port Pearl Harbor for holiday stand down and upkeep. Honolulu entered dry dock at Pearl Harbor Naval Shipyard for her first Selective Restricted Availability (SRA). Honolulu departed Pearl Harbor to begin at sea testing of new sonar systems and to participate in RIMPAC 88, a multi-national fleet exercise involving forces from Japan, Canada, Australia, and the United States. Following RIMPAC, Honolulu enjoyed a liberty call in San Diego over the Fourth of July weekend. On the return voyage to Pearl Harbor, Honolulu completed an unscheduled ORSE. 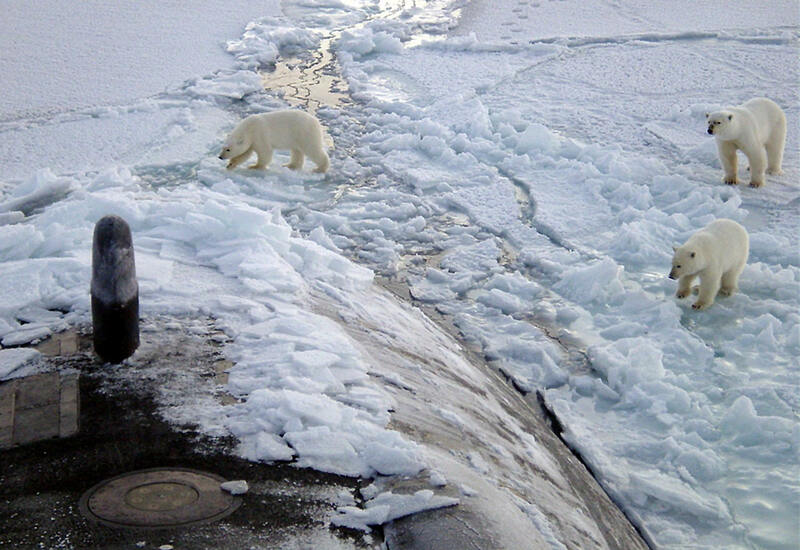 Following a two week upkeep, the boat returned to sea to participate in PCO OPS with Louisville (SSN 721). This rigorous at sea period took Honolulu to the Barking Sands range off Kauai, ending in a three day liberty stop at Lahaina, Maui and dependents cruise back to Pearl Harbor. Honolulu spent the month of September in upkeep before participating in PACSUBASWEX 89-1 (17-21 Oct) and conducting systems testing required for deployment. Underway from Pearl Harbor for her second western Pacific deployment. Following a month long mission, Honolulu visited Yokosuka, Japan for a ten day upkeep. Honolulu sailed to Hong Kong and moored alongside the fleet ocean tug Sioux (T-ATF-171). The crew enjoyed five days of liberty in the city. “Many took advantage of the China Fleet Club’s exchange and did some serious shopping for everything from oriental rugs to fine china to tailor made clothing. Everyone agreed that this was the best stop of the entire deployment.” Following the port visit, Honolulu embarked on a month long operation. Honolulu completed another operation and sailed to Guam for a post- operation upkeep alongside Proteus. Return to port Pearl Harbor. After post-deployment stand down, Honolulu prepared for the Naval Technical Proficiency Inspection (NTPI). 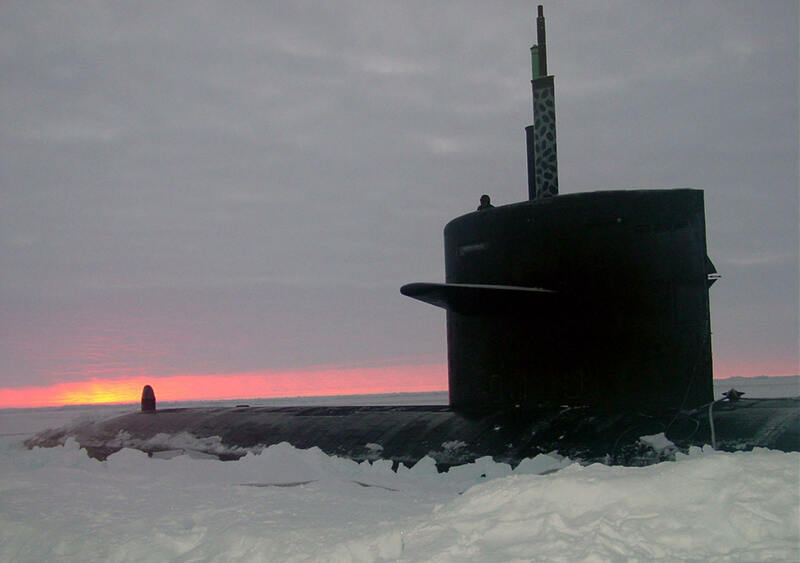 The ship completed the NTPI and received orders to deploy to the North Pacific. Underway from Pearl Harbor for northern Pacific operations. Honolulu spent the remainder of the year alternating in port upkeep and at sea services for various surface ships. The ship entered dry dock on 1 December. Underway for local research and development operations. Completed TRE in February and returned to port for upkeep in March and April. Underway from Pearl Harbor for north Pacific operations. Honolulu conducted PCO OPS and completed a successful ORSE. Honolulu entered Pearl Harbor’s floating dry dock Resolute (AFMD-6) for SRA. Honolulu completed sea trials and a shakedown cruise prior to returning to Pearl Harbor for holiday stand down. Honolulu spent the first quarter primarily at sea for PCO OPS, TRE and Tactical Weapons Proficiency. 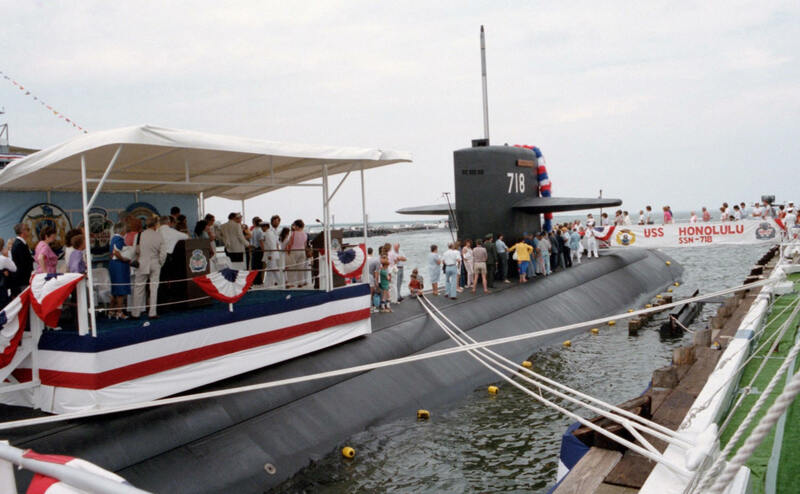 She returned to Pearl Harbor for her final POM upkeep prior to deployment. Underway from Pearl Harbor for western Pacific deployment. Honolulu conducted a successful deployment completing missions vital to national security and participated in operations with both Japanese and Korean naval forces. Honolulu also visited Yokosuka, Japan; Chinhae, South Korea; Sasebo, Japan; Guam and Singapore. Following stand down, Honolulu conducted a dependents cruise from Oahu to Kona. The crew enjoyed holiday stand down for the rest of the month. Honolulu completed a series of vigorous local operations (7-24 Jan) and PCO OPS (31 Jan-14 Feb). Honolulu returned for an arduous upkeep (17 Feb-20 Mar). Honolulu departed Pearl Harbor to begin TRE workup on 23 Mar. 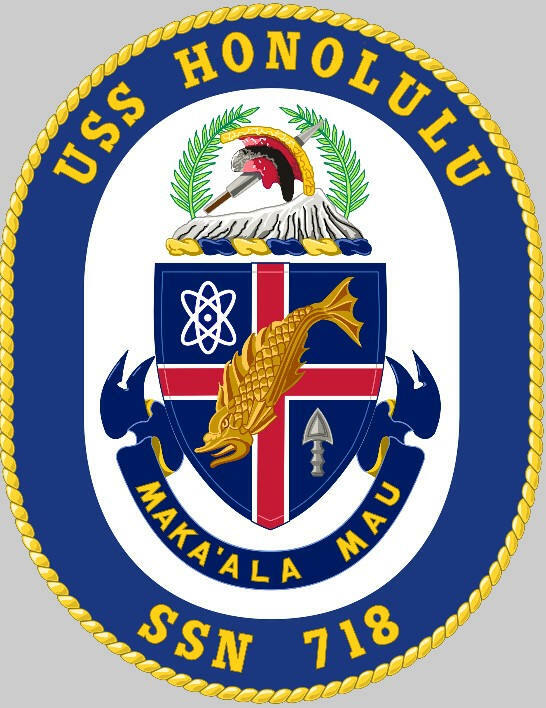 Honolulu completed TRE from April 27-29 and participated in PACSUBASWEX 92-3 (6-18 May), an exercise that involved four submarines developing active sonar tactics. The ship spent the following month in upkeep (19 May-19 Jun). 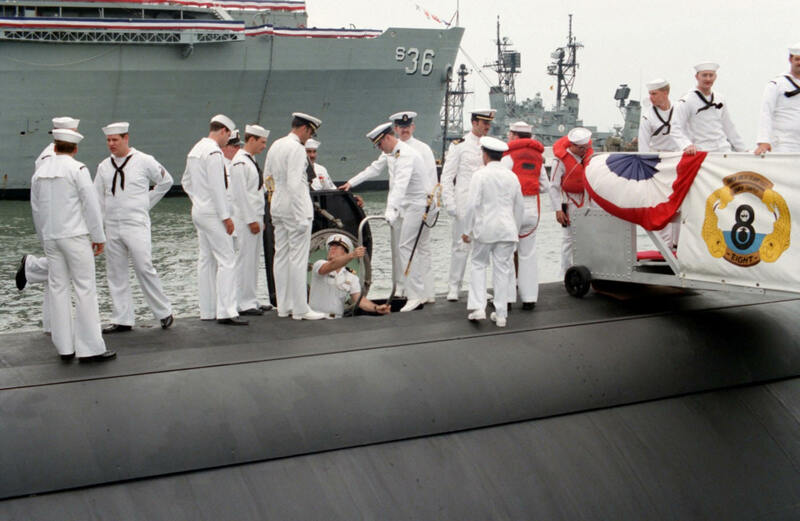 Following upkeep, Honolulu began workup for RIMPAC ’92. Underway for Eastern Pacific deployment and RIMPAC ’92. This international naval exercise involved vessels from the United States, Australia, Canada, Japan and South Korea. Honolulu visited several ports along the western United States and Canada including San Diego, CA; Alameda, CA; Bangor, WA; Nanaimo, British Columbia, Canada; and Esquimalt, British Columbia, Canada. 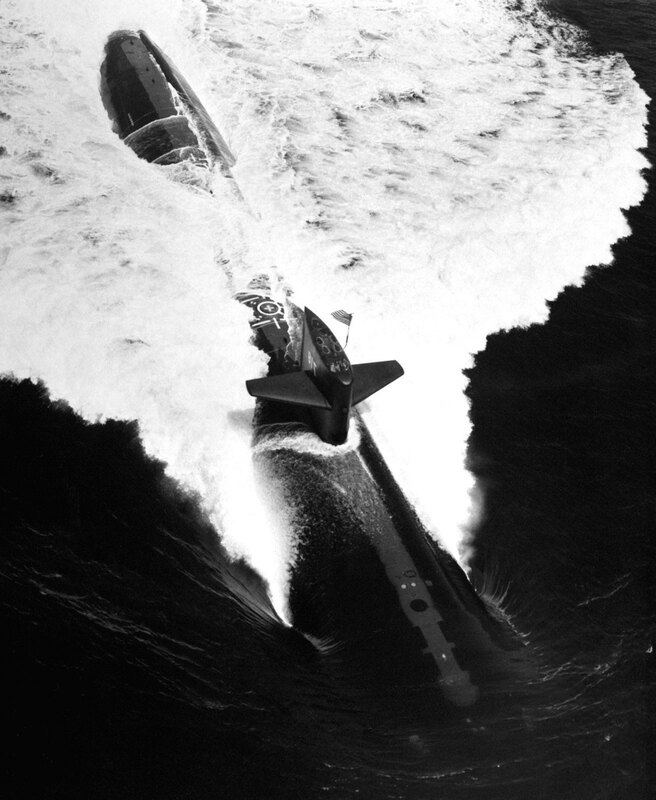 While visiting Nanaimo, Honolulu participated in the Nanoose Torpedo Test Range Exercise assisting in torpedo development. 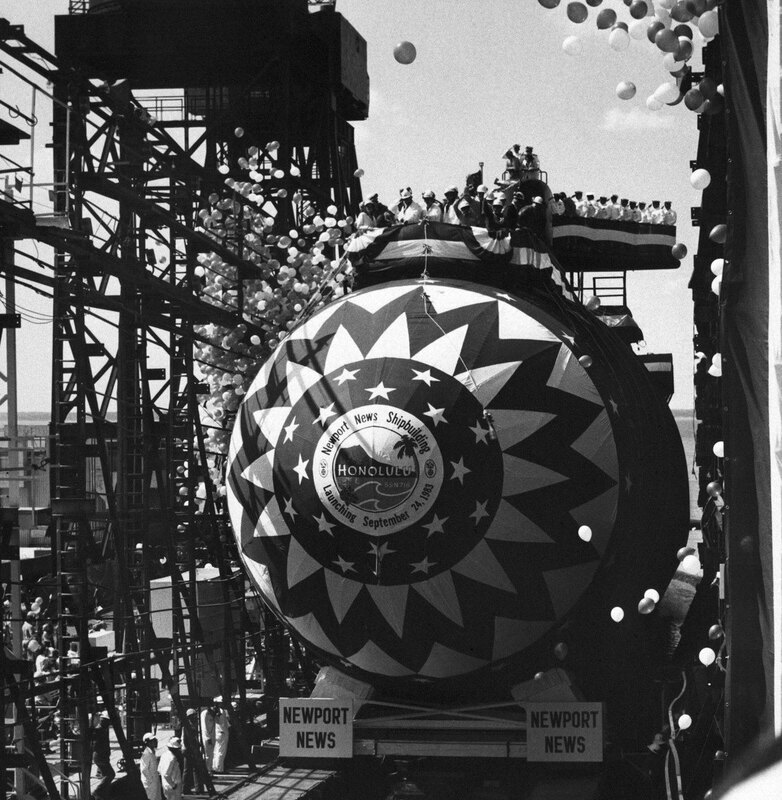 Honolulu returned to Pearl Harbor for a Depot Modernization Period (DMP), spending eighteen (18) months undergoing modernization work. Honolulu left dry dock on 7 April and began an intense crew training period. From May through August Honolulu completed Phase I, II and III crew certification. Underway for Tactical Weapons Certification. Underway for Eastern Pacific deployment where Honolulu conducted joint U.S. and Canadian operations. She enjoyed port calls in Nanoose, British Columbia, Canada (4-8 Nov); Esquimalt, British Columbia, Canada (10-14 Nov); Alameda, CA (25-30 Nov); and San Diego, CA (3-6 Dec). Honolulu returned to Pearl Harbor in time for holiday stand down. Honolulu spent the month of January underway for local operations, a VIP cruise (13 Jan) and a dependents cruise (14-17 Jan). Upon her return she completed a short upkeep. In April Honolulu participated in ENCOUNTEREX with the Abraham Lincoln (CVN-72) battle group (17-25 Apr). She completed TRE work up and inspection for much of May (3-19 May). 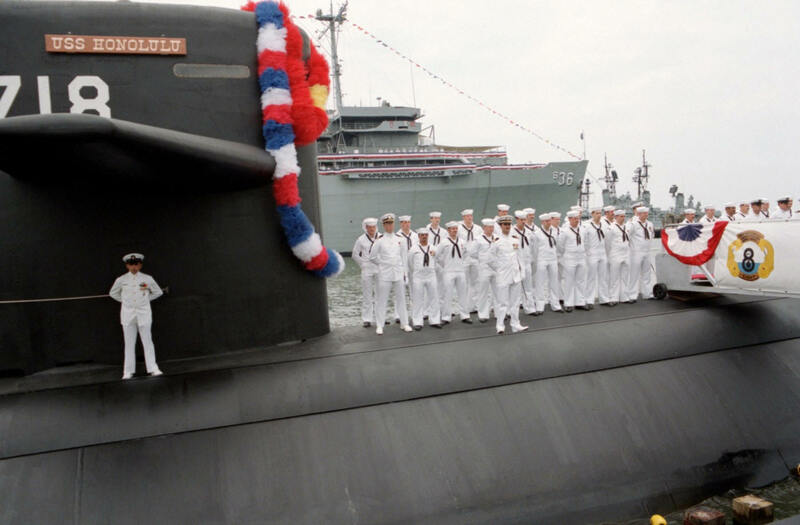 From 20 May to 5 July Honolulu completed her final POM upkeep prior to deployment. Honolulu completed Tactical Weapons Proficiency (TWP) (10-15 Jul) and POMCERT (21-28 Jul). 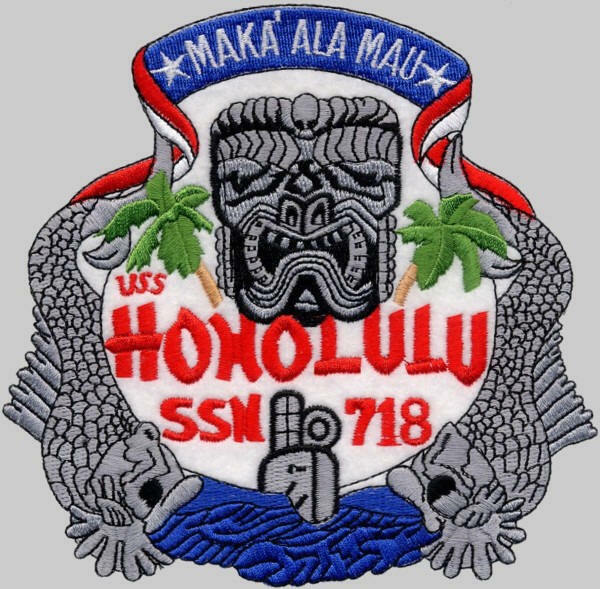 Throughout deployment Honolulu conducted operations vital to national security. She visited Yokosuka, Japan (21-31 Aug and 10-28 Oct); Singapore (8-16 Sep); Pattaya Beach, Thailand (19-24 Sep); Guam (24 Dec-8 Jan) and Brisbane, Australia (19-24 Jan). Honolulu completed a short upkeep in March after enjoying some post deployment stand down. 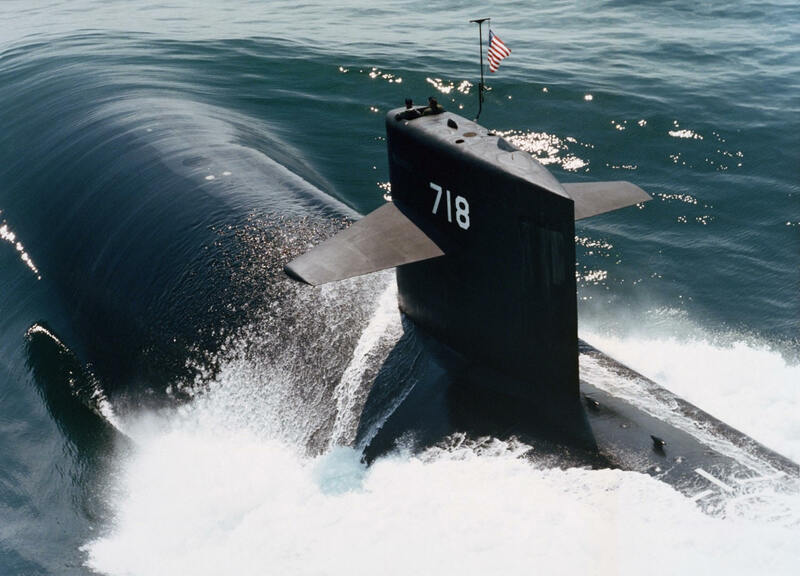 Starting in April, Honolulu spent several weeks underway providing TRE support for submarines Tautog (SSN-639), Pasadena (SSN-752) and Henry M. Jackson (SSBN-730). Honolulu enjoyed a dependents cruise to Maui (10-14 May) and a VIP cruise (15 May) prior to participating in RIMPAC ’96. From May through June Honolulu participated with the Independence (CV 62) battle group in RIMPAC ’96 providing valuable training for all ships involved. In port Pearl Harbor for IMA upkeep. Honolulu completed several inspections including TWP (22 Aug – 6 Sep), TRE (10-19 Sep) and ORSE (14-27 Nov). 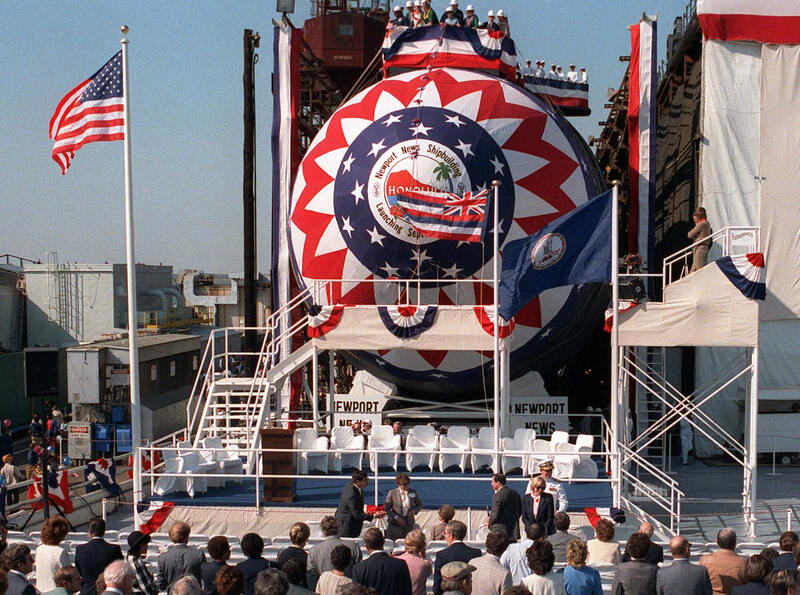 She also provided support to submarines Louisville (SSN 724) and Charlotte (SSN 766) prior to holiday stand down. In port for POM upkeep and training. Honolulu completed a successful deployment conducting operations vital to national security. She also participated in Exercise SEA EAGLE ’97, an operation with the Royal Thai Navy and P-3 patrol craft. Honolulu enjoyed several port visits including Okinawa, Japan on 3 May. Honolulu visited Pattaya Beach, Thailand from 12-17 May where she, along with sailors from USS Curts (FFG-38), Independence (CV-62), and Curtis Wilbur (DDG-54) made structural, electrical and esthetic repairs to a school for homeless children. While in Sasebo, Japan (24 May-3 Jun and 6 Jul), Honolulu hosted several dignitaries including Rear Admiral Kazunari Doke, Chief of Staff for the Japan Maritime Self Defense Force Sasebo District; Mr. Hideyake Miyajima, General Manager of Holiday Inn Sasebo and Mr. Yutaka Kawachi, a senior official from Shinwa Bank. While in Guam (29 Jul-6 Aug), Honolulu assisted in the effort to rescue victims of the Korean Airlines Flight 801 plane crash and she completed a maintenance availability. After completing Sea Trials (31 Jan-1 Feb), Honolulu conducted PCO OPS (9-14 Feb). 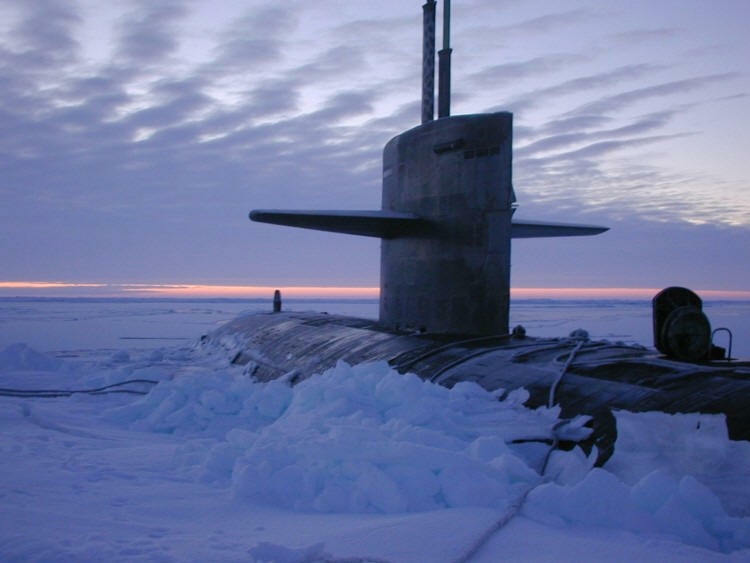 Honolulu sailed to Submarine Base Bangor, Washington and the South East Alaska Facility (SEAFAC) Acoustic trials range where she completed sound trials. 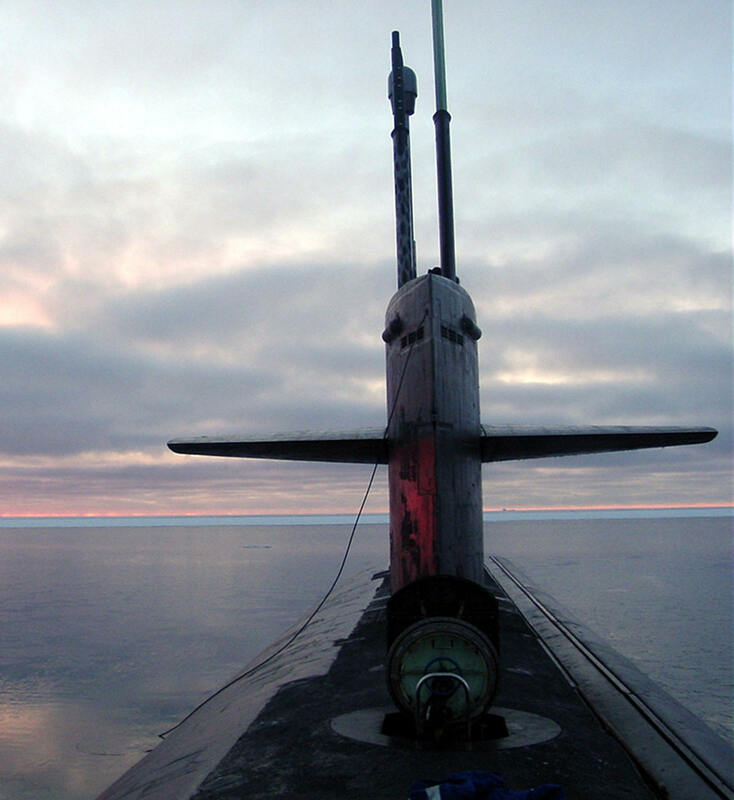 In Bangor, she participated in the first ever fast attack submarine TLAM loading exercise at Strategic weapons Facility Pacific (SWFPAC). Honolulu provided TRE and TWP support for various ships (15-27 Apr) prior to successfully completing her TWP (28-30 Apr). Honolulu completed a surprise ORSE from May 5-6. She then held a dependent’s cruise in Lahaina, Maui (9-11 May) before returning to Pearl Harbor to enter dry dock. On 4 Jun Honolulu entered dry dock at Pearl Harbor Naval Shipyard. Honolulu left the dry dock on 9 Jul and completed Sea Trials on 28-30 Jul. She participated in PCO OPS (2-15 Aug) before enjoying a port visit to Kona, HI (21-24 Aug). Honolulu spent the month of September preparing for the upcoming deployment. 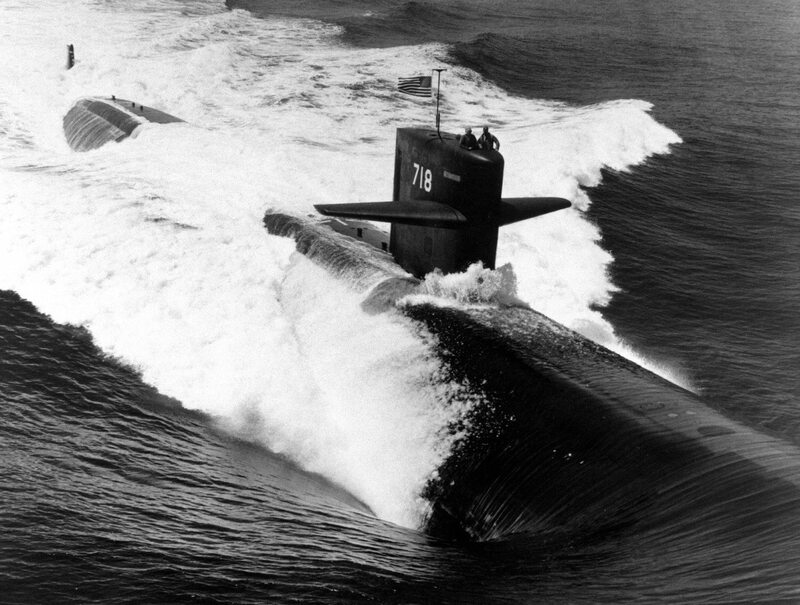 Honolulu spent much of the time at sea preparing for her TRE and POMCERT. She completed both inspections on 14-18 Dec. On 22 October, CDR Haney received the VADM Stockdale Leadership Award in Washington, D.C. Underway from Pearl Harbor for western Pacific operations. Honolulu completed a western Pacific deployment conducting operations vital to national security. Honolulu also participated in the multi-national exercise Tandem Thrust where she simulated attacks on the carrier Kitty Hawk (CV-63) and various American, Australian and Canadian warships. While deployed Honolulu hosted several special guests and dignitaries including RADM Masanori Ogino of the Japan Maritime Self Defense Force. Honolulu enjoyed port visits in Yokosuka, Japan (13-22 Jan and 7-21 Jun); Guam (4-18 Apr); Okinawa, Japan (20-24 Apr); Sasebo, Japan (15-17 May); and Phattaya Beach, Thailand (24-30 May). This time period was marked by several significant VIP tours starting with a visit from officers LCOL Cheong, LCOL Lee and CAPT Liow of the Singapore Royal Navy (21 Jul). On 23 July Honolulu hosted The Republic of Korea Ambassador, Sung, National Defense Assembly Committee Chairman, Mr. Han, Assembly members Mr. Hur, Mr. Lee and Mr. Bin and Military Representative, CDR Choi. Underway for EASTPAC ’99 where Honolulu participated in several exercises including FLEETEX and JTFEX with the John C. Stennis (CVN-74) Battle Group. Honolulu enjoyed a brief stop in Bangor, WA (18-22 Oct) before launching an exercise Tomahawk Land Attack Missile (TLAM). Honolulu also visited San Diego, CA (27-29 Oct and 8-12 Nov) before returning to Pearl Harbor on 23 November. Honolulu spent the month preparing for Mine Certification and enjoyed holiday stand down. Honolulu spent the first quarter of the year alternating in port upkeep and at sea operations and inspections. During this period Honolulu completed Mine Readiness Certification Inspection (MRCI) and Torpedo Exercise (10-14 Jan), Combat systems Readiness Review (CSRR) (18-26 Jan), PCO OPS (27 Jan-11 Feb), INSURV (15-16 Feb) and ORSE (28 Feb-16 Mar). In port Pearl Harbor for POM Upkeep. In port Pearl Harbor or upkeep and pre-deployment training. Honolulu completed PDT and completed a final POM upkeep prior to successfully completing POMCERT. Honolulu conducted missions vital to national security. She participated in two multinational exercises, Exercise Foal Eagle and exercise Annualex. Honolulu enjoyed port visits in Yokosuka, Japan (18-22 Sep, 18-21 Nov and 24-31 Dec); Chinhea, Korea (20-22 Oct); Sasebo, Japan (2-8 Nov). Local operations, Hawaiian Operations Area. Underway from Pearl Harbor for northern Pacific Arctic deployment. Honolulu hosts professional golfer Michelle Wie for a VIP tour. 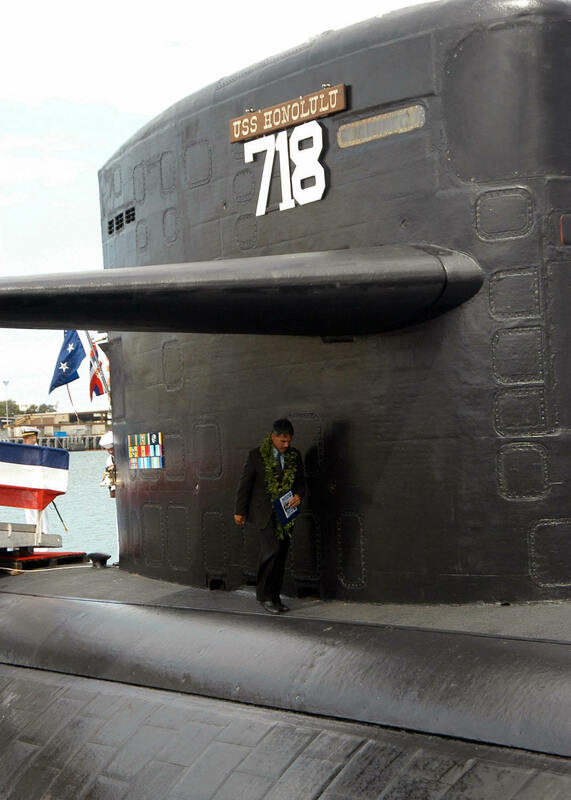 Senator Daniel Inouye, Lieutenant Governor James Aiona, and Pacific Fleet commander Admiral Gary Roughead joined past and current crewmembers of the Honolulu to bid farewell to the nuclear powered attack submarine. Underway from Pearl Harbor for final western Pacific deployment. 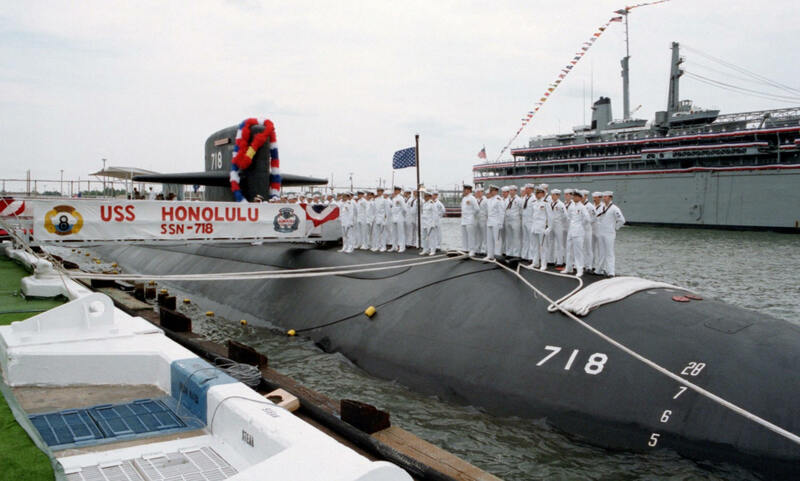 Honolulu returns to Puget Sound Naval Shipyard for inactivation, decommissioning and recycling. 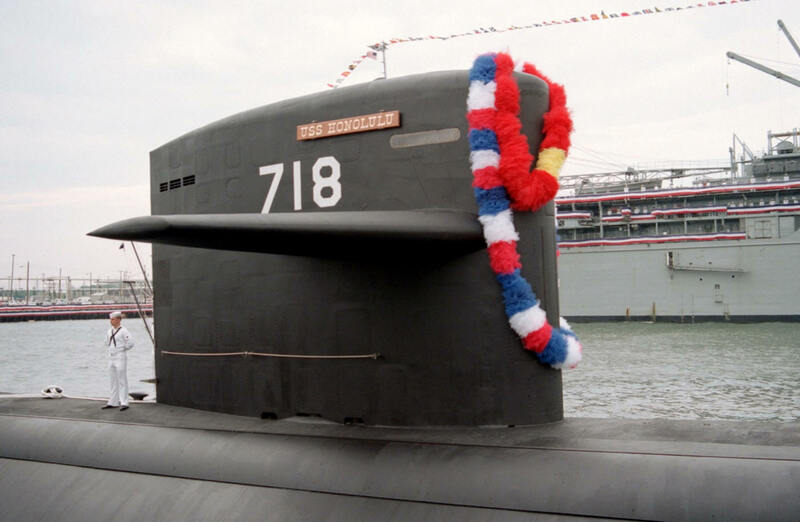 In an unusual decision to actually recycle part of the submarine, the shipyard planned to transplant the bow of retiring Honolulu onto submarine San Francisco (SSN-711, which had been severely damaged after it ran into an underwater sea mount off Guam in 2005. Honolulu held a farewell ceremony in Pearl Harbor on 15 April 2006, that included remarks by Senator Daniel K. Inouye, Lieutenant Governor Duke Aiona, U.S. Pacific Fleet commander Admiral Gary Roughead and former Honolulu commanding officer Vice Admiral Jonathan Greenert. Honolulu put to sea in early May 2006 for her final patrol. Her last patrol ended at Puget Sound Naval Shipyard in October 2006 where she was placed on stand down, on her way to decommissioning. 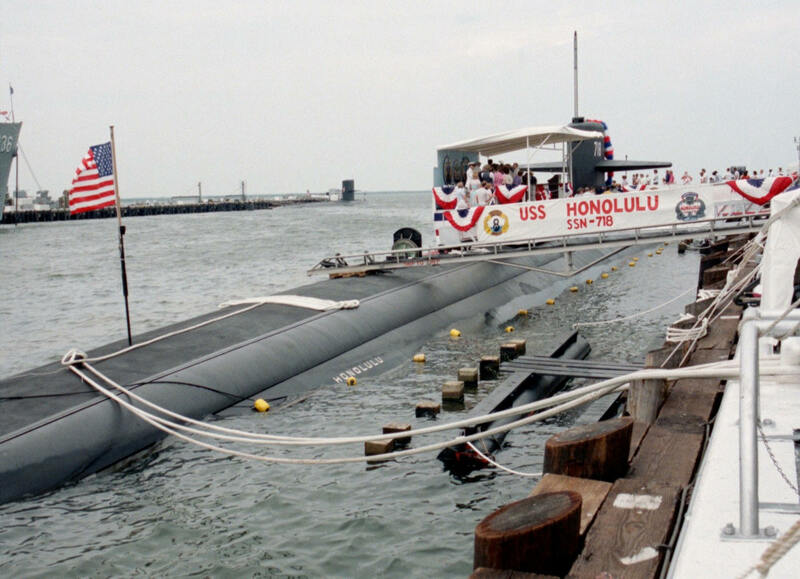 Honolulu was decommissioned and stricken from the Naval Vessel Register on 2 November 2007. 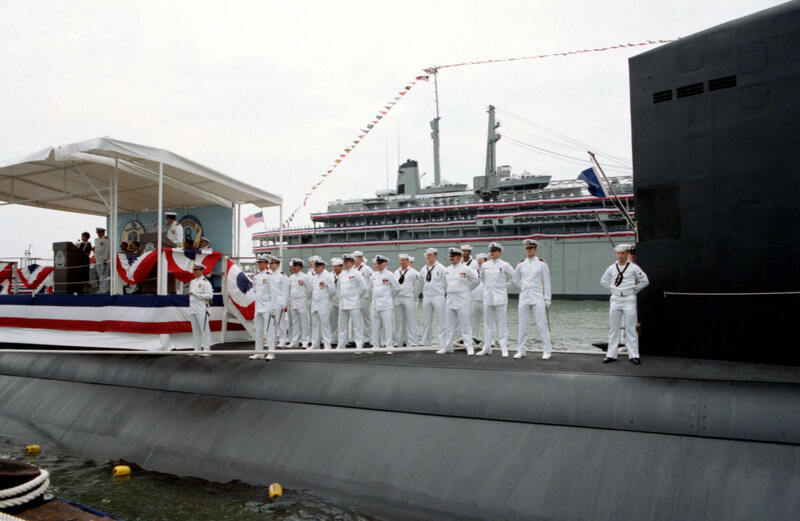 Ex-Honolulu entered the Nuclear Powered Ship and Submarine Recycling Program in Bremerton, Washington. 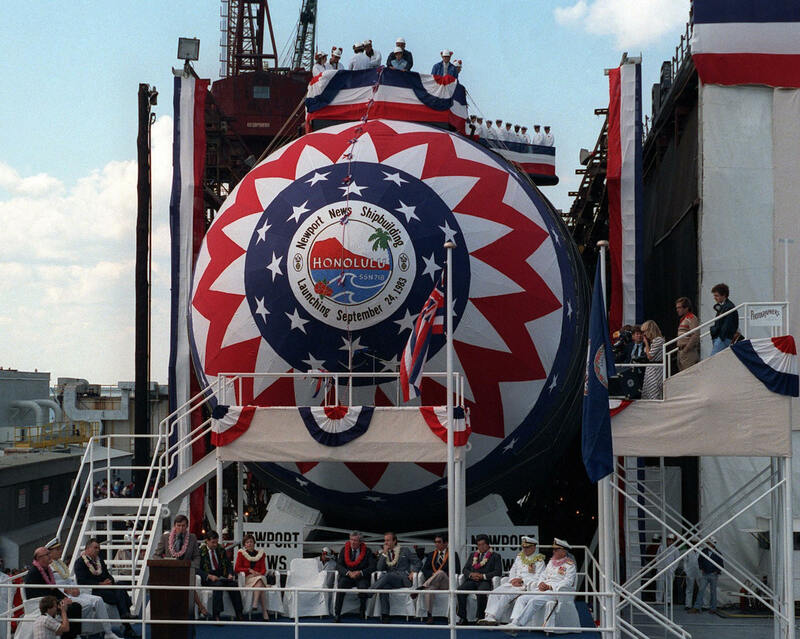 The forward section of ex-Honolulu was transferred to USS San Francisco (SSN-711), repairing extensive damage caused by a severe grounding San Francisco experienced in 2005. The "challenging, one-of-a-kind project" was completed on 20 October 2008.